Motto: "The nature is beautiful everywhere, although NOT every country is perceived as beautiful. Thus we need to appreciate even more each time we meet beautiful people." Due to a very lucky convergence of circumstances I was given the opportunity to get to know the country with exceptionally beautiful people. It is the South Korea. On this web page I am going to share with the reader my impressions of this country of beautiful people. As a young boy I listened to a lot of old Polish folk prophecies about a country, that is to become the next superpower on Earth and the last leader of humanity. Although these prophecies did NOT indicate which exactly country it will be, on the basis of various premises, which I listed in item #H1.1 from my web page named prophecies.htm, I deduced logically that it would most probably be Korea. Toward this future role of Korea as the last superpower and the leader of humanity seems to also speak strongly the message which stems from verses 1:27-29 of the book "1 Corinthians" in the Bible. This particular verse is discussed more broadly, among others, in item #C4.8 from my web page named wszewilki_jutra_uk.htm. After all, these Bible verses were initially applicable to all previous superpowers and leaders of the world. It is intriguing for me also that all these premises seem to suggest, that the mechanism that will uplift Korea onto the level of superpower and leader of mankind, will be that as the first country in the world Korea is to build the swift like light and the invincible interstellar spaceship of my invention, called the Magnocraft - which appearance, dimensions, and the unique manner of flying presents the 4-minute long free video from YouTube entitled "How Big is the Magnocraft". In turn the premise that Korea will also be the world's last superpower and the last world leader, is derived from "The Periodic Table of Epochs in the History of Mankind" - presented as "Table #K1" of my web page named tapanui.htm, and as "Table #A1" of my web page named humanity.htm. The main goal of descriptions from this web page and illustrations which I present here, is to make available my photographically documented personal impressions from the visit in the extraordinary country called the South Korea. The additional goal is to direct the reader's attention to this positive and moral aspects of Korea, about which the rest of the world typically knows almost nothing. When just before the 1st of March 2007 I went to Korea, so that for the invitation of the governmental program assume my professorship on one amongst Korean leading universities, I knew about Korea only as much as the biased mass media are passing to people in their propaganda. In addition, my attitude towards that country were programmed difficult circumstances in which I were then, and which I am describing in part #A1 of the web page about myself (Prof. Dr Eng. Jan Pajak), and partially also in item #K4 of the totaliztic web page wszewilki_jutra_uk.htm. However, after the arrival to Korea I experienced a kind of nice shock. It turned out that inhabitants of Korea belong to the most nice to relate people in the world. In turn Korea itself is one of the most fascinating and progressive countries of the world. This web page tries to illustrate at least this sparse number of interesting aspects of Korea, which hit my eyes during the brief - because only 10-month long, staying in Korea, and which I managed to document photographically. In item #I1 from my web page named quake.htm I described an unusual type of super-moral people who in the English-language Bibles are usually called with the name "righteous" (I personally think that it would be more appropriate to use for their description the explained in item #B1.1 from the web page antichrist.htm the more modern term "soldier of God". For some time now I am particularly interested in these "righteous" people. This is because my objective research documented, amongst others, in items #I3 to #I5 from the web page named petone.htm, confirmed scientifically the promise from the Bible, that if in (or around) a town or a city lives at least 10 of such "righteous" people, then that town or city is protected by God from being destroyed by any cataclysm that God sends. The actual fulfilment of this divine promise I am verifying and documenting for a number of years now, on the New Zealand township named "Petone" (in which I live), the neighbouring towns and cities of which are continually troubled by all kinds of natural cataclysms - which however jump through Petone without causing any damage in it (for the documentation of these cataclysms see items #I3 and #I3 .1 from the web page named petone.htm). On the existence of these "righteous" people I direct the reader's attention here, because according to my personal estimates, the described on this web page country of South Korea, in 2007 had the highest density of "righteous" people amongst all the countries where I had the pleasure to stay for a period of time long enough to allow me to get to know the level of morality of people who inhabited it. (In the second position for the level of density of such "righteous" people, was the province of Sarawak from the Malaysian tropical island of Borneo - the moral state of which I learned in years from 1996 to 1998.) That high concentration of such "righteous" people in South Korea, in my opinion explains why that country, in spite of its small size, recently is becoming a world economic and industrial superpower. This kimchi (kim-chi) is usually eaten in the form of raw salad added in Korea in small amounts to almost every meal. I personally ate it only once a day - on the occasion of my lunches in the cafeteria from the place of my employment, and this only in working days, as on Saturdays and Sundays I usually did NOT ate my lunches in there. Immediately after I started my professorship on 1 March 2007, a local helpful Korean sit next to me during a lunch and explained that "kim-chi" contains ingredients which cause burning the tissue fat. I did NOT believe him too much, because the biggest authorities keep announcing that there is NO known diet which would effectively burn the tissue fat. (Supposedly if it is known, the author of it would become a millionaire.) But just in case I started to eat scrupulously all the "kim-chi" which they served with my meals. At the beginning of July I checked my weight and noticed that I slimmed 5 kilograms since the date of my arrival to Korea 4 months earlier. This slimming was accomplish in the situation that I was always satisfied with my food and that I ate in almost the same way like in my home, means the same amount of food and the same kind of food. In turn after my wife joined me in Korea, I ate exactly the same dishes as I do in home - but plus this kim-chi. Thus clearly the "kim-chi" in fact did on me its miraculous work. I also noticed that in Korea there are almost no fat people. Because locals eat kim-chi continually, almost for sure it is the kim-chi that keeps all Koreans so slim. (In Korea there is even a popular joke that "Koreans like their kimchi more than they like their wives".) As for a medicine, "kimchi" tastes very well - for me it slightly resembles the taste of Polish sauerkraut - only that it is a bit less sour but more spicy, because it contains a lot of "hot" red chilli (paprika). Local Koreans eat around 50 to 100 grams of kimchi in the raw form as an addition to practically every meal. The outcome is such, that South Koreans eat very well, as they have a lot of food and in their culture lies good and frequent eating. But in spite of this good and frequent eating they have almost no obese people. I am so impressed by the effects of eating kim-chi, that I decided to make this dish after returning home and eat it as frequently as I can. Together with wife we managed to get hold of an authentic Korean folklore recipe for making kim-chi, and we even took part in making kim-chi to learn exactly all details of making it. The only question remains whether kim-chi produced outside of Korea is going to maintain its healing properties (and thus also the slimmer figure of eaters), and also whether outside of Korea there will be the right mood, will, and possibilities to have it regularly. In turn the explanation why kim-chi is so good for human health is provided on other web pages. For example in July 2007 search engines indicated two such web pages with addresses treelight.com/health/nutrition/KimchiHealthy.html, and davidtinney.net/korean-kimchi-recipe.html. On the other hand, the name "kim-chi" itself reveals why the present official human science does NOT know really why "kimchi" works as it works. After all, the component of this name is the word "chi" - with which in China which is a neighbour of Korea, a kind of intelligent energy is described which is absolutely necessary for living. (In these old days when the recipe for kim-chi was developed, a significant area that presently belongs to China then belonged to Korea.) In turn what is this intelligent energy "chi", it is explained only now by a relatively new scientific theory called the Concept of Dipolar Gravity. Unfortunately the official human science does NOT wants to recognise the merit of findings of that theory. More information about what actually the intelligent "chi" energy is according to the Concept of Dipolar Gravity, can be found, amongst others, on totaliztic web sites about the Concept of Dipolar Gravity, and about evolution. In turn examples of utilisation of this intelligent energy "chi" in various areas of life, is described amongst others on web [pages about Wrocław, Wszewilki of our tomorrow, mysteries of the town Malbork, and also about the Zhang Henga seismograph working on "chi". Fig. #1ab: Here is the illustration of making an extraordinary Korean dish called "kim-chi", which, amongst others, keeps healthy and slim almost the entire population of Korea. The name "kimchi", or "kim-chi", is assigned to the fermented mixture of flakes of spicy paprika popularly called "chilli", with the Chinese cabbage (locally called "Napa") and with several other healthy and taste additions. It tastes a bit similarly as the European sauerkraut. Only that kim-chi is slightly less sour but more spicy (or rather "chilly"). This fermented kim-chi accumulates in itself the intelligent "chi" energy and generates various enzymes, which turn out to be extremely healthy for the human digesting system and for human body as a whole. For example, according to various internet web pages about the health consequences of eating kimchi, such as web pages indicated above in item #B1, a systematic eating kimchi gives a whole array of health benefits, which include amongst others: acceleration of burning the mid-tissue fat, making the eater more resistant to bacteria and viruses (this is probably why no-one ever heard of a Korean flu), aiding the elimination of unwanted (bad) cholesterol, fighting allergies, regulation of the sugar level, reinforcing the stomach lining, giving life and maintaining the bacterial flora that is required for the health of intestines, etc., etc. Fig. #6a (left): The scene from a group production of "kim-chi" by Korean housewives. 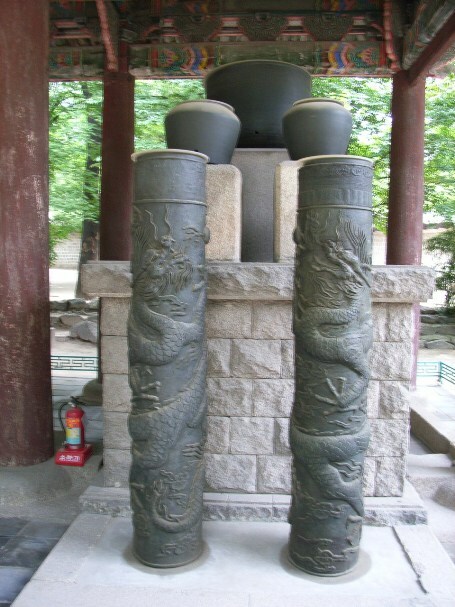 This scene is displayed (together with the authentic folklore recipe for making kim-chi), in the "National Folklore Museum", Gyeongbokgung, Seoul, South Korea. The above folklore scene of making kim-chi is shown in the National Museum of Korea. 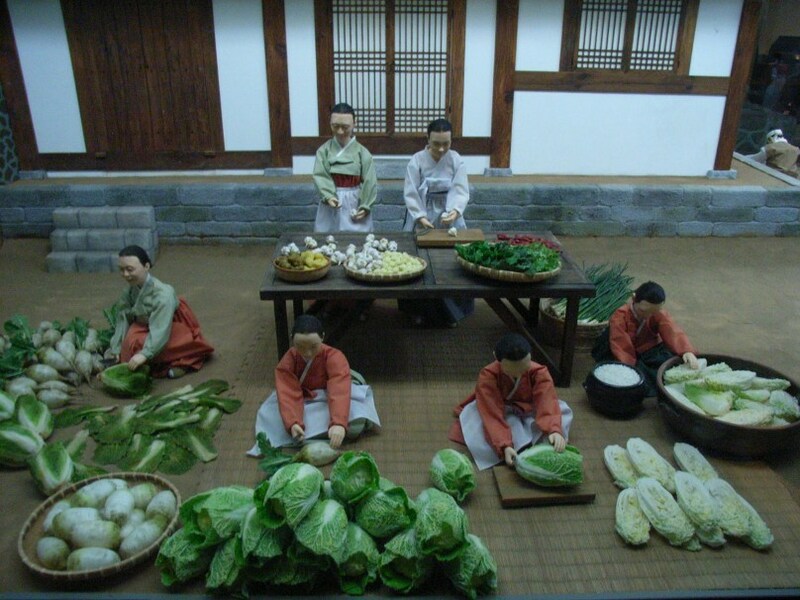 The same museum makes available to visitors the authentic Korean folklore recipe for making kim-chi. One needs to remember that in order to accomplish the health benefits of kim-chi, and also to enhance its taste values, in kim-chi typically should be a whole list of ingredients shown on the next photograph. In turn the authentic folklore recipe for making this dish is quite a complex one. In addition this recipe has many variations, not each one of which displays the same health benefits. Fig. 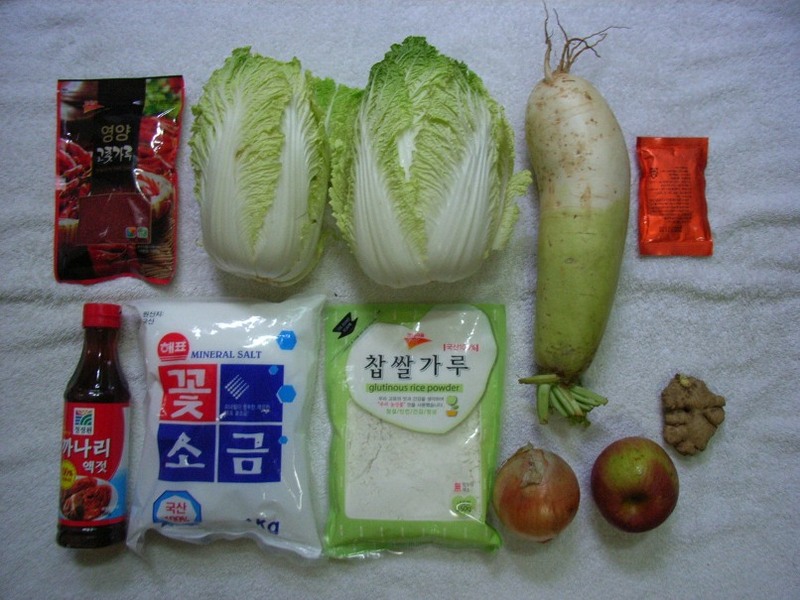 #1b (right): Here is the illustration of ingredients used for making kim-chi according to the authentic folklore recipe from Korea. This illustration doe NOT keep weight proportions nor amounts of ingredients used for making kim-chi, because it tries to mainly show the appearance, consistency, and packing of subsequent ingredients. Shown are on the above photograph (top row - counting from left to right): (1) flakes of red spicy Korean paprika (popularly also called "chilli") - it is worth to notice that the same hot paprika, but purchased in the powder form (instead of flakes) unfortunately is NOT suitable for making kim-chi (for kim-chi it must be smashed in the mortar for flakes of around 3 mm in diameter); (2) two heads of Chinese cabbage - in Korea called "Napa" (in the Chinese-Cantonese language it is called "Wong Nga Pak") - please notice that in order to obtain its healing attributes the kim-chi cannot be made from an ordinary European cabbage; (3) root of radish; (4) garlic squashed to grains of the rice size; (lower row - also counting from left to right): (1) Korean "Fish Sauce" - means fermented fish in liquid form (for the lack of original Korean sauce, one can also use the sauce from Thailand or slightly lesser quality sauce from Vietnam - which are fermented from fish according to almost the same recipe and have almost the same ingredients); (2) mineral salt (large grains, not refined); (3) glutinous rice powder; (4) onion; (5) sweet apple; (6) fresh ginger; (7) two lives of fresh spring onion - not shown on this photograph (I did NOT have it at the moment of photographing). Notice that you can see the enlargement of each illustration from this web site. For this it suffices to click on this illustration. Furthermore, most of the internet browsers that you may use, including the "Internet Explorer", allow also to download each illustration to your own computer, where it can be looked at, reduced or enlarged to the size that you may want, or printed with your own graphical software. Independently from Korean "kimchi", similarly almost miraculous health capabilities have also the Japanese soup called "miso". Such "miso" is prepared from appropriately fermented soy dough. In past I watched a documentary film about this unique soup. The film contained claims of Japanese people that the soup has a capability to heal even light versions of "radiation illness" - i.e. the one from exposures to radioactivity. In New Zealand grows a kind of native bush called "manuka". Small flowers of it have some natural ingredient which causes that the "manuka honey" just by itself and in normal concentration undergoes a kind of natural fermentation in the result of which it acquires various healing properties - for details see the article "Honey gives up healthy secret" from page A13 of the New Zealand newspaper Weekend Herald, issue dated on Saturday, April 18, 2009 (this newspaper e.g. the antibacterial attributes of the "manuka honey" assigns to the substance called methylglyoxol). Notice that this natural fermentation in the full concentration of the "manuka honey" is NOT the same as the fermentation carried out during the production of "mead" (i.e. an alcoholic drink made of honey), in which for initiating the fermentation it is necessary to dissolve honey significantly and to add yeast. A funny although sarcastic aspect of the highly medicinal "manuka honey" is, that because of its profitability New Zealand Maoris try to gain monopoly for it. But because in the United Kingdom someone grows manuka bushes to produce this highly medicinal honey, Maoris tried to legally take from him the manuka bushes - accusing him that his ancestor "stole" these bushes from New Zealand - e.g. see the article "Manuka honey stings at $144" from page A4 of New Zealand newspaper The Dominion Post, issue dated on Wednesday, May 20, 2009. In reply to this accusation, the Englishman replied in a television interview that he is happy to give back manuka bushes to Maoris - if, however, Maoris give him back the European bees which produce manuka honey and which his ancestors brought to New Zealand. His point was that before the arrival of Europeans to New Zealand there were no bees in there that would produce honey. (The stingless native bees of New Zealand are kinds of flies which lick nectar from flowers and pollinate plants, but live and multiply alone like flies and do not produce honey.) This reply of the Englishman well disclosed the greed motive that hid behind Maoris attempt to deprive him manuka bushes, and thus eliminated all further attempts of Maoris to take these bushes from him for obtaining the world's monopoly for the uniquely medicinal fermented "manuka honey" that is in high demand and very profitable. So it appears that fermented food hides some mysterious key to health of humans. It is pity that Poles who eat a lot of fermented food are so reluctant to carry out detailed health research on attributes of their numerous fermented foods, such as Polish "sauerkraut", old Polish pickled cucumbers, or fermented "gałąbki" from Polish cabbage and grout. In such case scientists probably also would then discover many extraordinary capabilities of food that in old times was traditionally fermented in Poland. After all, in an old Polish folklore such fermented food was also used for healing purposes. For example, myself I remember until today that in times of my youth, when I caught a cold, parents healed me through giving me to drink juice from Polish "sauerkraut" or through giving me to eat Polish "pickled cucumbers". I also remember that both, my mother as well as my grandmother, with a religious strictness stuck to old recipes of food preparation which they knew, because they claimed that in case when these recipes are changed, then the food is to loose its holy properties and its health advantages (more on this subject is explained in item #B3 of the totaliztic web page fruit.htm). A very old Polish food, the health attributes of which should intrigue us especially, was the traditional Polish holy daily bread typically baked at home according to an extremely old Polish recipes. In this "holy daily bread", the dough was "grew" due to subjecting it to the process of fermentation (in past popularly called "pickled dough"), not through being saturated with bubbles of gases from gas-generating chemicals - like today bakers do it with the modern bread. Only such a fermented bread was in past considered to be "holy" - as this is explained more comprehensively in item #F2 (14a) of the totaliztic web page named god_proof.htm. Also only such a black like soil (or like a German "pumpernickel") fermented old Polish "holy daily bread" was extremely healthy and tasty. In fact, people who used to eat this holy bread, typically in the entire their lives did NOT need to see a doctor. Motto: Totalizm teaches that "every goal that is possible to invent is also possible to accomplish" - even the trouble-free sliming down. One only needs to find a way how to accomplish this. My eating experiences from Korea are thought provoking. Before I arrived to that country, as a typical "book-worm" I had problems with my excess weight. In fact my stomach looked like the one on paintings of Napoleon. I was unable to get rid this stomach in spite of undertaking various painful diet and starvations which Chinese describe with a juicy expression "dog pooh diets" - this name results from a fact that according to a jocose saying of Chinese these diets make their victims so hungry that even if they see a dog pooh, they still have a temptation to pick it up and eat it. However, after my arrival to Korea I rapidly discovered that I can easily loose over 1 kilogram of weight (fat) a month, only because everyday on the occasion of my main meal (i.e. lunch) I eat around 50 to 100 grams of raw "kim-chi" as an additional side dish to whatever was given to me on this meal. What even more interesting, in order to slim down with this method, I do not need to change my taste preferences, I can eat as much as I wish, I do not need to implement any special diets nor exercises, nor I need to change my style of living. Kim-chi turned out to be this "miraculous sliming diet" which painlessly gave me what other diets only promised but in spite of the pain of their undertaking - never delivered this promise. With our making kim-chi in person, two problems are linked, namely (1) getting ingredients, and (2) finding the recipe. Therefore if the reader wishes to try this "Korean folklore sliming diet" firstly I suggest to check whether is able to get the most vital ingredient - namely the Chinese cabbage, then check the remaining ingredients - as these shown below in "Fig. #1b". Another problem is getting the authentic Korean recipe for kim-chi. If someone does NOT intend to fly personally to Korea, then can be some problems with this one. The point is that after I learned the authentic Korean folk recipe for making kim-chi, I checked several such recipes placed in Internet. In the process I discovered that details of the authentic recipe, which in my opinion are the most vital for gaining by kim-chi its health and sliming capabilities, for some strange coincidence are absent in these Internet recipes. I do NOT know whether this is just a coincident, or systematic and intentional action of this "Pajak's serpent" which is described in item #D2.2 of the web page about the Concept of Dipolar Gravity. No matter what is the reason for which these significant for health details are absent in many Internet recipes, it reminds the fact that if someone uses such not-authentic (or simplified) recipe from the Internet, he or she can land making just a taste substitute for kim-chi, which, however, will not display the healing nor sliming abilities of the authentic kim-chi. Results of scientific research make Koreans really proud of their "kimchi". After all, there is no other dish in the world which would bring to the eater as much benefits as kimchi does. Thus about "kimchi" in Korea were written numerous doctorates and even more books. Unfortunately, these are rarely read in other countries because typically these are not translated into other languages and also because the Korean alphabet is rather unique. The Korean book about kimchi which is scientifically very valuable, which was entirely translated into English, and which I managed to purchase, was the book by Dr Sook-ja Yoon, entitled Good Morning Kimchi, Hollym Publishers, Seoul, South Korea 2006, ISBN 1-56591-216-0, 128 pages, soft cover. This book is complemented by the own web page of its author, having the address kfr.or.kr/ (unfortunately almost entirely in Korean, thus for an European it allows only to look at pictures). In the real world in which we live, everything has its own principles of operation and drawbacks that result from these principles. These in turn not always work in the manner that we would like them to work. Therefore, at the end of this item, I am going to explain what drawbacks of the method of sliming down through eating kim-chi I managed to notice during my own experimental use of this method. The first amongst these drawbacks is that if our sliming down depends only on additional eating kim-chi, without the change to our lifestyle nor our eating habits, then the amount we slim down has its limits. These limits result from the principles on which kim-chi works, NOT from the amount of fat we accumulated. In other words, kim-chi decreases our weight only by a given percent, then it establishes a new equilibrium weight which is several kilos lower than the weight we had before we started eating kim-chi. I estimate from my own outcomes, that kimchi decreases the weight by around 10% of the initial weight that we had before we started eating this dish. Then this our new weight stops decreasing in spite that we still keep eating kim-chi and that we still have significant fat reserves to loose. Another drawbacks of this method of sliming down through eating kim-chi is that this method works only for the duration when we continually eat kim-chi without any interruptions. This means, that for as long as we eat kim-chi systematically each day, our weight remains on this lower level. But when we stop eating this dish, while we still maintain the same eating habits and the same lifestyle, then our weight immediately begins to lift up, until it reaches the weight that we had before we started eating kim-chi. This gaining on weight is almost 3 times faster that the speed of loosing weight after we started eating kimchi. In my case, at the beginning of period when I started to eat kim-chi in addition to my meals, I used to loose slightly less than 2 kilograms per month. But when I stopped eating kim-chi, in the first month I gained almost 5 kilogram per month. Fortunately, this gaining the weight after we stop eating kimchi has also its limit equal to exactly the same weight that we had before we started to slim down with the use of kim-chi. (Actually after every diet that I tried in my life, always the weight returns to the level from before the time of dieting immediately after the dieting person returns to his or her normal eating habits and normal lifestyle.) In other words, the method of a controlled by us sliming down without changing our eating habits nor our lifestyle, described here, is useful for cases when for some reasons (e.g. a wedding, a trip, a new job, etc.) we wish to decrease our weight for a specific duration of time by the value of around 10% of our NORMAL weight. Spring onions – cut into 1 inch length and chopped the white part of the spring onions into small pieces. 1. Chop the Napa cabbage into quarter and then into small bite size and leave it in a container. 2. 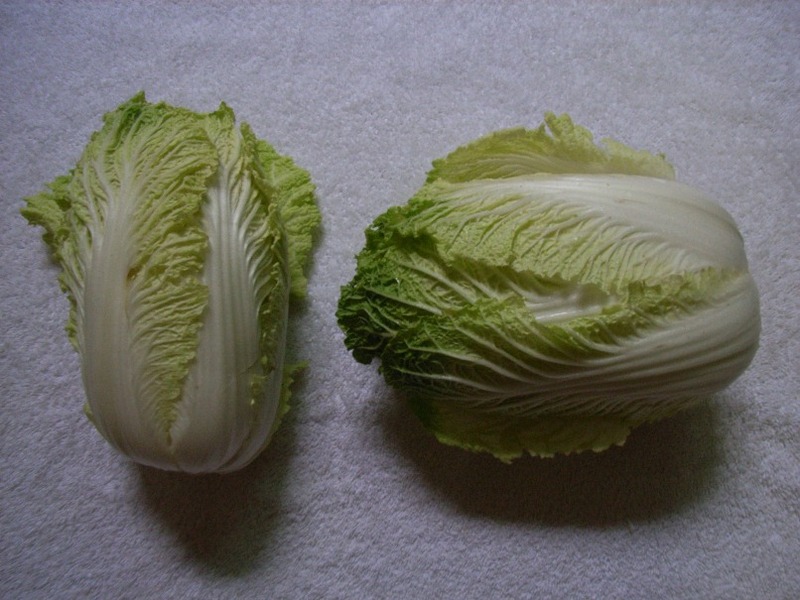 Sprinkle salt and water alternately onto the chopped cabbage (like you would sprinkle your clothes before you iron i.e. if you don’t have a steam-iron). After a few sprinkles you fold it with you hand – the bottom to the top and top to the bottom - and continue the process until all the salt has been used up. You can taste the saltiness by eating a piece of the thickest part of the cabbage and the middle of the cabbage should be salty. Leave it aside but continue to turn the cabbage with your hands every 15 minutes and leave it to soak in the brine for approx 2 hours or when the cabbage is soften and salty to taste. After 2 hours of soaking you rinse the cabbage with running water and leave it in a colander to drain for later use. If it is not drained well you could lightly squeeze off some of the water from the cabbage just before you mix the sauces into it. 3. Grate the radish into thick strips (julienne) and leave it in a bowl for later use. The radish will give the kimchi a crunchy bite. 4. Prepare starch. For this: mix 1 cup of water and 1 cup of Glutinous Rice Flour and stir continually over low fire until it thickens in a semi runny state. Leave it to cool over a bowl of cold water for later use. (6b) Then add the apple, ginger, onions mixture into it. Add the 3 tablespoonful of pounded garlic. Mix well. (6c) Add 10 tablespoonful of Fish sauce into the above mixture and continue stirring. (6d) Check the colour of the sauce. The colour of the sauce should be dark red and not orangey in colour, if it is orangey in colour you can add in a wee bit of red pepper or you can taste it while mixing the sauce for saltiness and spiciness. Note: There is bound to be some left-over sauce each time you mix the sauces and you can use as much of the sauce as required and leave the rest in a container and keep it in the freezer for later use when you make the next batch of kimchi. 7. Mix. Wear a pair of disposable gloves when ready to mix the hot pepper sauce into the cabbage and radish. 8. Mix a wee bit of the sauce at a time – first into the radish, mix well, then add the cabbage into the same bowl and mix in more pepper sauce until the cabbage and the radish are well covered with the sauces. Add the chopped spring onions into the bowl and mix well. 9. Ferment. Scoop the vegetables into a porcelain jar or good quality plastic container and leave it in room temperature for l day (in summer) or for 2 days (in winter) to ferment. 10. Storage. After the fermentation yields the level of sourness that satisfies us, you should then transfer the container of kimchi to the fridge. I have also heard that the kimchi juice that is collected at the bottom of the jar is a good tonic for fighting off a cold. 12. Guarantee. I, signed below, herewith provide my personal guarantee that the kimchi recipe presented here well represents a typical recipe used by housewives from South Korea, that I received this recipe (and also practically researched its implementation) from a prosperous and well eating Korean family which uses this recipe already for many generations and on which one could see with the naked eyes the health benefits of eating kimchi, and that this recipe contains all elements that decide about maintaining by it all health benefits of kimchi, which elements I verified for this recipe by comparing it with other recipes for making Korean kimchi that were available for me. Suwon, South Korea, 19 July 2007. Present human medicine is splashing promises as to what can be accomplished in the future through the research on so-called "stem cells". With these loud promises it tries to silence the moral hangover that results from the use of cells which originate from human embryos. After all, in some cases of this research, in order to be able to carry it out, it becomes necessary to take the right to life from a potential human. On the other hand, it is highly immoral to take life from potential humans in order to heal already living people. So no wonder that the research on stem cells of human origins have so much opposition. In addition results of these research are to be able to help people only in a far future. A good expression of goals of research on "stem cells", the most important illnesses which these stem cells are expected to heal, and the nature of objections that these research most frequently encounter, contains the article entitled "Latest stem cell 'achievement' gets cold reception" which appeared on page A2 of the New Zealand newspaper named Weekend Herald, issue dated on Saturday, January 19, 2008. Here is a brief excerpt from that article: "Scientists say stem cells from cloned embryos could be a valuable tool for studying diseases, screening drugs and perhaps someday creating transplant material to treat conditions such as diabetes and Parkinson's disease. But some critics say the procedure amounts to creating a human life in a lab and then destroying it to harvest the stem cells. Others raise concerns about health risks and exploitation if large number of women are asked to provide eggs for widespread cloning." However, a shocking fact is that healing with cells of the action very similar to the predicted action of these "stem cells" the folklore of Korea uses successfully for centuries, if not for thousands of years. And all this without the need to have any "moral hangover". The reason is, that these Korean substituted for stem cells originate from insects, not from people. In folklore of Korea these cells are obtained through just ordinary eating "silkworm pupa" shown in the photograph below. These silkworm pupas contain components in themselves which after eating trigger mechanisms in eaters that cause any cells from the eaters' bodies behave as if these are stem cells - i.e. any cells from bodies of eaters transform or generate cells that the eater is missing. In the result of this, in Korea one can hear many descriptions of difficult illnesses which were healed through just ordinary eating of these "silkworm pupa". I will not repeat here these stories because someone may accuse me of dissemination of a medical heresy. However, the picture which emerges from descriptions of people with which I talked on this subject, is close to whatever the present medicine claims that in future will be possible to accomplish due to the use of stem cells. For example, at the very beginning of lists of illnesses which for centuries are healed through eating of silkworm pupa the folklore of Korea indicates exactly the same key illnesses which medical scientists hope to heal in the future with the use of stem cells. Simultaneously healing with silkworm pupa is chip, can be applied immediately - without carrying out many-years long medical research, and without "moral hangover" because one uses embryos that in order to heal firstly required an immoral robbery of some other human. Where these silkworm pupa can be purchased in Korea. Well, NOT in pharmacies, but on an ordinary bazaar - see the photograph below. But I must admit that when I looked at them then I was sure, that with my European eating habits I would need to be really in a critical health situation to force myself to eat this miraculous medicine. (Probably I would also need to imagine that I am a bird.) Already cooked and tinned silkworm pupa can also be purchased in Korea in supermarkets - as it is also considered to be a delicacy. In the folklore of Korea silkworm pupa is eaten in three different forms. The most devoted connoisseurs of this delicacy eat them raw (i.e. dried) - as one can see them on the above photograph. Myself, after over a half of year walking around them like a proverbial "dog around a hedgehog", finally for the good of science and this web page I managed to try how they taste raw. As it turned out, in the first moment after putting to mouth such a dry silkworm pupa, one has an impression as if one placed in mouths a large, soft raisin. But from the skin of this supposed raisin leaks to saliva a powerful taste and smell of like an old "musty cellar", or old, damp, underground tunnels. However, thus musty taste disappears soon after one bites and smashes the pupa with teeth. Then it takes quite a pleasant taste and crispiness of a young walnut. Means the taste only around one-third as strong as a ripe walnut. (This weak walnut taste have young walnuts which are eaten when they are still in green hull and which after breaking are peeled from this brown skin that after reaping cannot be peeled and which gives to their kernel this strong nutty taste.) This pleasant walnut taste of silkworm pupa causes that in Korea it has a lot of connoisseurs, each one of which eats around a half of glass of this delicacy (and medicine) at a single sit. Independently from eating raw these dried silkworm pupas, they are also eaten after boiling or frying. In case of boiling them, they are boiled in a salted water and eaten immediately after being cooked - when still hot. On bazaars of Korea one can meet stands in which silkworm pupas are boiled while after boiling - sell to passers by (priced at around 1 US$ for a half of quarter-litre glass of this delicacy and medicine). Around such a stand which boils silkworm pupas the air is saturated with the same unpleasant smell of "musty cellar", which I described in the previous paragraph. Supposedly the most tasty these silkworm pupas are when they are fried. Koreans fry them in oil, after adding almost an equal amount of garlic to additionally improve the taste. During the medical eating of dried silkworm pupas, these are eaten usually in two portions a day, around 12 hours apart (i.e. one portion in the morning and another portion in the evening). In each one portion usually two table spoons of dry silkworm pupas are eaten - this gives around a half of the glass being eaten each day. Typically before eating they are meticulously washed in water - as many as three times. This their washing for me more resembles a ritual than actual washing. Then they are boiled in fresh water with salt (sometimes water is enriched by spices to improve the taste). For medical purposes are eaten not only these boiled silkworm pupas, but also the water in which they are boiled is being drunk. Usually a sick person needs to eat systematically these pupas for at least two months to have some visible healing accomplishments. Theoretically speaking the same healing effect as for silkworm pupas should be accomplished during the use of any pupas - if only their caterpillars do not contain some chemicals that would be detrimental for human health. 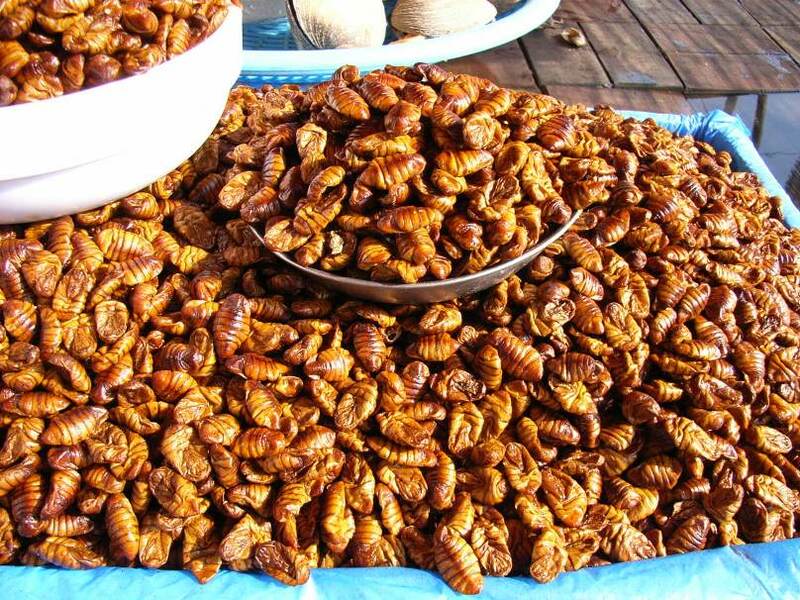 But because for healing purposes one needs to eat a lot of these pupas (counted in kilograms) to have some healing results, apart from silkworm it would probably be difficult to find a required supply of it. Furthermore, it is already confirmed experimentally that silkworm caterpillars do not contain nor produce any chemicals that would be detrimental to human health. In turn any other pupas still could have such chemicals. In present world almost every country cultivates and processes silkworm pupa (I know for sure that e.g. Poland does it in Europe). However, for the production of silk utilised are only cocoons in which these pupas wrap themselves, while pupas are later disposed of. Thus probably all factories which process silkworm pupas have a massive supply of these pupas with which they do NOT know what to do. Probably they dispose them to rubbish dumps or feed to pigs - without realising that these pupas actually are miraculous (and simple in use) folklore medicine with characteristics of "stem cells". Therefore, to those readers who have someone close and much loves in health situation sufficiently desperate that for getting better this person would be prepared to eat silkworm pupa in kilograms, and whose illness belongs to the kind which in future is promised to be healed by "stem cells", then probably it is worth to try this old folklore Korean remedy. After all, if such silkworm pupa does NOT help, for sure it should NOT make things worse either. For reasons which I explained more accurately on other web pages, e.g. on web pages memorial.htm - about methods of suppressing specific research or evil.htm - about sources of evil on the Earth, research on utilisation of "stem cells" are pushed forward behind the scene in spite that in many cases this research induce various moral objections. On the other hand silkworm pupa carry in themselves mechanisms of action which allow to accomplish without any "moral hangover" and almost immediately practically all the same healing effects that immorally are promised by researchers of "stem cells". Unfortunately, no-one currently carries out research on healing mechanisms of silkworm pupa. Therefore, at this point I have an appeal to the readers, to morally enforce wherever they can the initiation of research on healing mechanisms that hide in these humble silkworm pupa. Our civilisation would benefit from such research, not mentioning about moral tortures of these ill people who in the future will be aware that in order to recover their own health they need to deny the right to live to some other potential human. Fig. 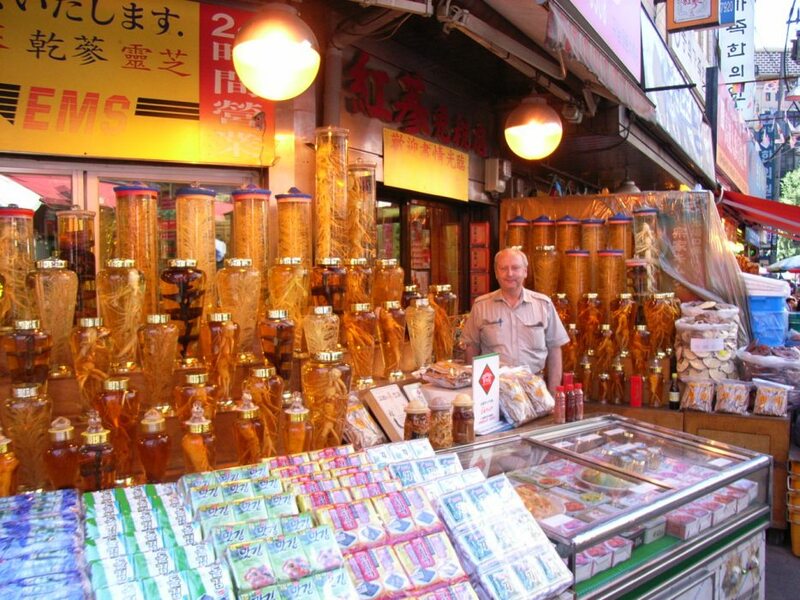 #2: Here are dried "silkworm pupa". These are used in the folklore healing of Korea for centuries or perhaps even for thousands of years. These pupas already now provide healing accomplishments similar to the ones which only lately are promised by so-called "stem cells" that the official human medicine started to research not long ago. This means that "silkworm pupas" are able to regenerate damaged cells and tissues. Unofficial folklore of Korea claims that such "silkworm pupas" are able to heal a whole array of malignant illnesses. Fig. #3: An example of tired pupils from a Korean school, whom the teacher who guides them allowed to squat for a moment to rest. It is easy to notice that they rest disciplined in fours, without walking away from the column, without protesting, without disturbing the order of the column nor their own position in marching, at every moment ready to stand up on the signal from their teacher and to continue the tour on which they were taken. I must admit that I teach the entire life, but so disciplined school pupils I have NOT seen in any other country apart of Korea. Rather otherwise, because of the lack of discipline amongst school pupils, in a number of countries in which I used to teach, taking students for a tour is a kind of nightmare and torture to enduring of which many teachers must be forced by their superiors. In addition, such a large group of pupils in some countries would require by local bylaw to be guided and supervised by at least four adults (e.g. four teachers or four parent volunteers). But in Korea it is enough that such a group is taken for a tour by a single teacher which has a full control over the situation. We know it well from our everyday life. Someone works in one profession, but swears on that profession because took it by a mistake and in reality would like to work in a completely different job. In this manner our European societies are full of scientists, who would really like to be painters, painters, who really dream about the career of politicians, politicians who would like to become bankers - only that God does NOT gave them funds required, etc., etc. The outcome is that in such a society almost no-one takes seriously his or her profession and activity, while if he or she does something, then is doing it like a big favour and completely without enthusiasm. But in Korea the situation looks totally different. If Koreans do something, they put into it whole themselves. In the result, when they work, the job almost "becomes hot in their hands". When they strike, they do it with conviction and have real battles with police. When they go to church, then they pray with such a devotion and place such a great attention to details, that even myself - i.e. the creator of totalizm and the first scientist on the Earth that proved the existence of God, I salute them totally impressed. Fig. 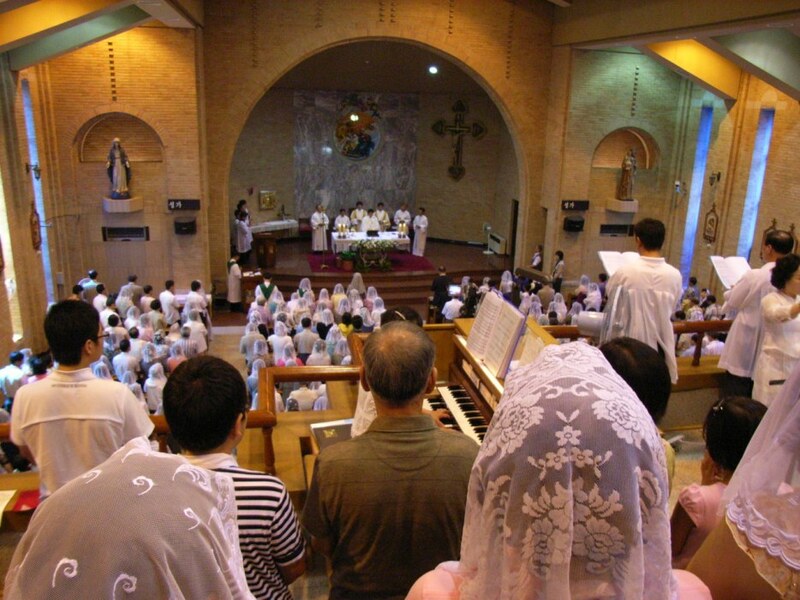 #3b: Here are "white-heads" in a Korean Roman-Catholic Church. (Click in order to see this photograph enlarged.) This photograph was taken in August 2007. Old time in Poland the name "white-heads" described women - because in church they wore white veils on their heads. As I still remember well, this Christian tradition diminished in Poland in times of my childhood. When I was a small boy (i.e. in 1950s), my mother and grandmother taking me to church still wore just such white veils on their heads - similar to veils which on the above photograph can be seen on heads of all Korean women praying in the church. In turn when I become an adult, women that participated in masses from Polish Catholic churches ceased to wear such white veils. (This probably is the reason why at present women in Poland are NOT called anymore "white-heads".) But in Korea women voluntarily do this until today - as this is revealed by the above photograph. When people in Korea do pray, they do it truly with devotion and fire, making sure that every tiny detail is correct. In the same manner they do also in every other matter which they decide to attend. It is believed in Poland, that Poles lead the world in their devotion to faith in God and to Catholic church. However, in my own opinion, Koreans long ago overtook Poles in thoroughness and fire with which they serve God. Of course God is NOT blind for such expression of devotion. So He blesses Korea in many different ways. For example, at present Korea has one amongst the highest standards of living. Crimes based on immorality almost do not exist in it. People in the majority are trustworthy and act morally in there. Other nations can only envy them. After all, behind moral behaviour of the entire society always follows happiness, peace, prosperity, and personal security of each individual citizen of this society. Koreans are proud of their history. This history states that they originate from "Hans". (In the Korean language "han" means "one" and "united".) If I remember it correct, there was an argument amongst Polish poets of the past, whether Poles originate from "Ormians or from "Hans". Fig. #4: Here is a photograph of "prototype" for one of the most moderns kinds of present rocket weappon - means so called "katyusha". It is exhibited in the king's palace "Deoksugung" in Seoul. 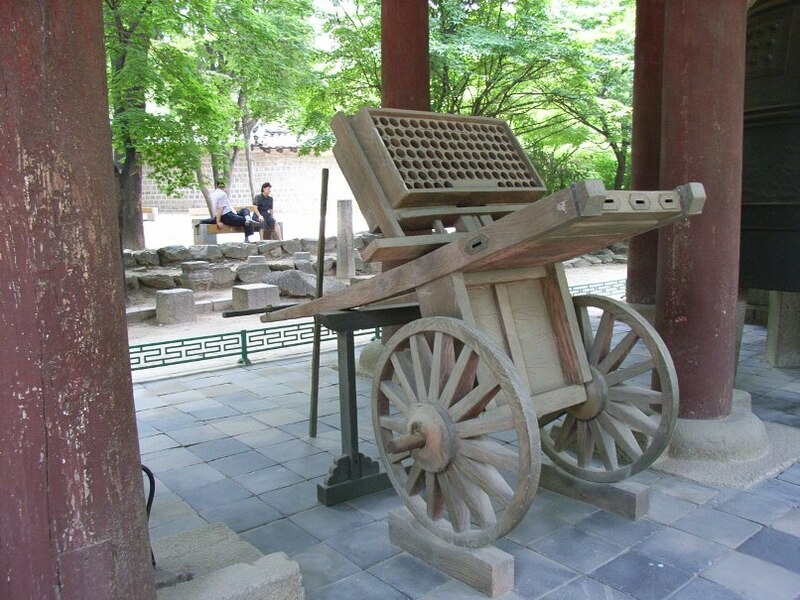 The only thing that can make us wonder in this prototype, is that the improved version of this weappon, shown on this photograph, was build in Korea in 1448 AD, while the inventor of it, someone named Choe Museon lived several centuries earlier in times of Goryeo Dynasty. So now it becomes visible where Russians got their idea for their "katyusha" rocket lounchers, and also what kind of weappons was used to scare horses of the Polish "husaria" during the mediaval wars with Mongols. In fact no many people is aware that so "modern" weappons as "katyusha" in fact is already around a thousand years old, and that a long time before it was used in Europe it was already in a common use on the Far East. 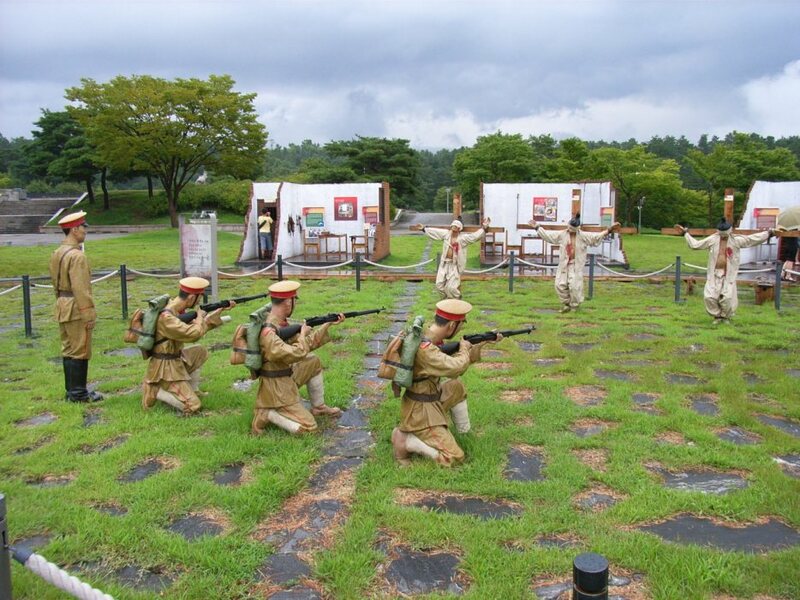 For some strange reasons Korea had the history similar to Poland. Continuous aggressions, annexations, occupations, bloody wars, etc. It is sad to see how this brave nation has suffered. An example of the treatment experienced by many innocent Koreans is shown on "Fig. #5" from the web page bitwa_o_milicz_uk.htm - about the battle for Milicz (click on this "green" writing to see that photograph). The everyday use of technology can shock in Korea. In fact, as so far, I have not met a nation the everyday life of which would be saturated with such a large number of technical gadgets as the life of a typical Korean. Of course, I did NOT live yet in every country of the world, e.g. I did NOT live in Japan yet, so perhaps there are nations even more saturated with technology than Koreans are. But Koreans are incomparably greater consumers of modern technology that all other nations that I know of (i.e. than Poles, Germans, Swiss, New Zealanders, Australians, Malaysians, Singaporeans, Cypriots, and also neighbours of these relatively well known to me nations). As I also noticed, from the point of view of practical skills in the use of modern technology, my Korean students would "eat for breakfast" students from all other countries that I lectured so-far. Fig. #5: The oldest and the largest water clock of the world, or more strictly what remains of it until today. It is exhibited in the king's palace "Deoksugung" from Seoul. This clock automatically and fluently was showing current hours and minutes with the precision close to present Swiss clocks. The above clock differs, however, from precise Swiss clocks by the date when it was constructed. The model shown here was build in 1536 AD. But it was an exact copy of an older clock build in 1434 AD by someone named Jang Jeongsil. That clock builder also based his work on even older models. In one afternoon of August 2007 I was strolling along the ornamental stream that flows across the old town of Soul in the South Korea. This stream is called "Cheonggyecheon Stream". By the north-west bank of it a row of small workshops of various specialisations is located. This area is called the "Industrial Tool Arcade". The majority of these workshops is very similar to each other. So I passed by them without a greater interest. But rapidly one of them attracted my attention. By the entrance of it stool small like "fountain". Only that otherwise than it is in a fountain, in this one water was pouring from top to down. This water was gashing from a large, heavy, bronze tap which clearly "levitated in mid-air". The first impression after I saw this tap was for me almost a shock. I stopped like hypnotised and for checking whether I see it correctly I involuntarily moved my hand around it to verify that there are no any invisible wires or hidden magnets on which the tap could be suspended, or whether it contains some hidden mirrors that would visually misled witnesses. But the tap really was hovering in the thin air. I could not believe my own eyes. Even with my technical mind it took me a bit of time before I worked out how this tap works. As it turned out the principle of it was very simple. In spite of this it makes so striking advertising impact on witnesses. Of course, immediately I photographed this "levitating tap" from all possible directions, while photographs of it I am showing below (see "Fig. #6abc"). Herewith I also reassure the reader that these photographs are NOT any photomontage nor "trick". I wonder whether the reader is able to work out all on his own how this "levitating tap" actually works, and also how long it takes to the reader to work out in person the principle of operation of this "levitating tap". Fig. #6abc: Koreans are technical geniuses. For example above I am showing photograph of a "tap which levitates" and which is pouring water while hovering in the thin air. 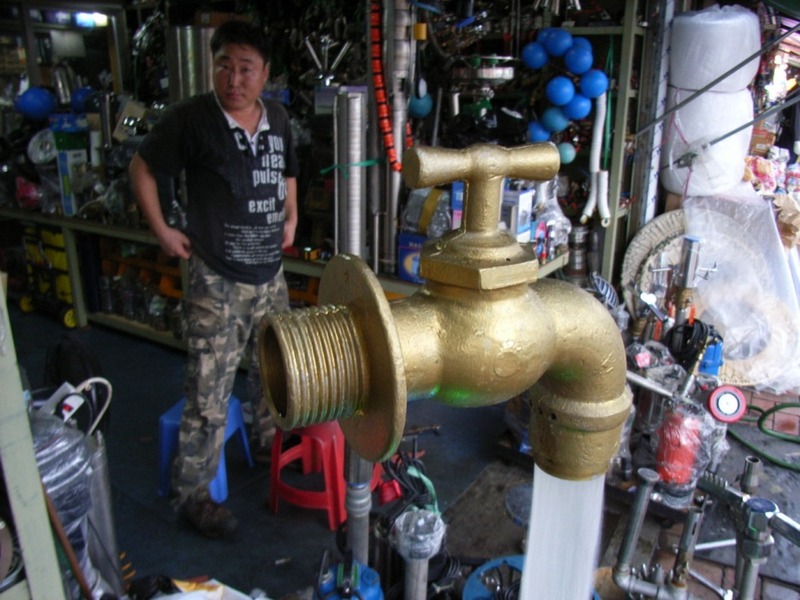 This tap is used as an effective advertisement for technical skills of the owner of a small workshop at the entrance of which it was exhibited. The operation of this tap is hypnotizing passers by, attracting to the workshop many new clients. I myself could NOT resists to photograph this tap and I did not leave this workshop for as long as it took me to work out on what principles this tap works and "levitates". Fig. #6a (left): Here is the photograph of this "levitating tap" shown from the direction of footpath. 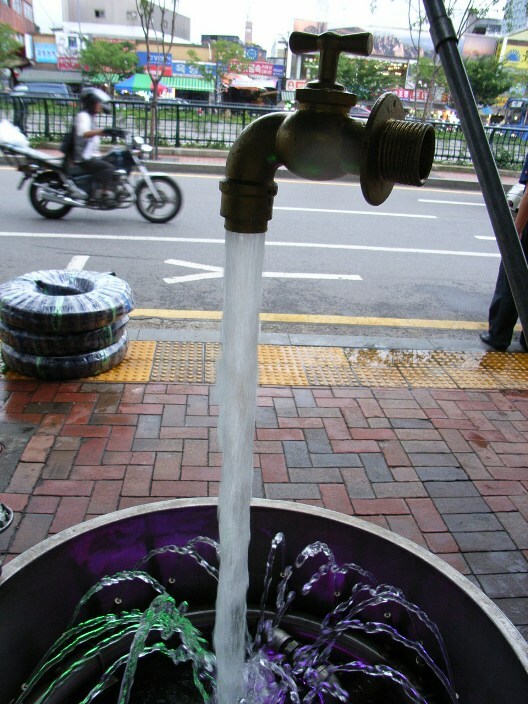 In fact this tap looks like a fountain, only that it pours water from top towards down, instead - like a fountain, from down to top. On the background we can see the owner of the workshop who utilises this tap as an efficient advertisement for his technical skills. Close-up photograph of the same "levitating tap" can be seen if we click on this "green" writing. Fig. 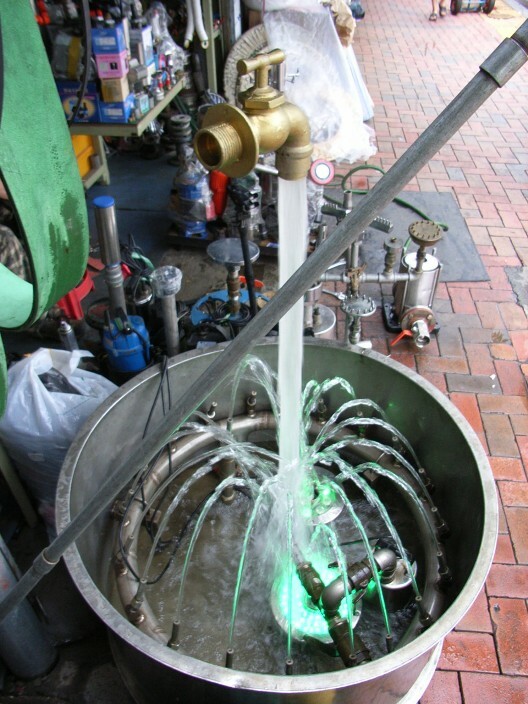 #6b (middle): Here is the photo of the same tap taken in the direction from the inside of the workshop towards the street. This photograph clearly shows that the tap in fact "levitates", and that there are no any hidden wires or magnets which would hold it suspended in the mid-air, nor that the hovering of it in the mid-air is not simulated by some hidden mirrors. Fig. 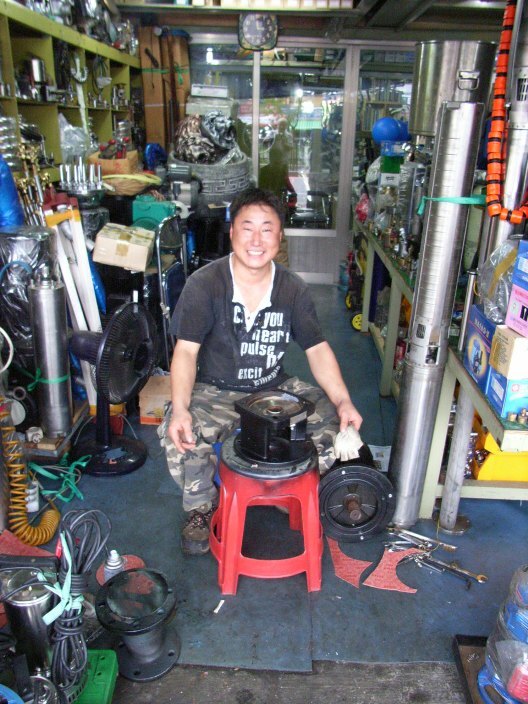 #6c (right): Here is the proud owner of the workshop, who made for himself an advertisement in the form of this "levitating tap". As one can see, he smiles from ear to ear. After all, his tap attracts him many clients. So he has plenty of orders and full wallet. Would you, the reader, able to invent similarly intriguing advertisement for your own workshop? Or perhaps you would be able to work out how to build such a tap so that it works as this is shown on the above photographs. Koreans have very refined sense of humour. Below I am showing several photographic examples of it. Fig. 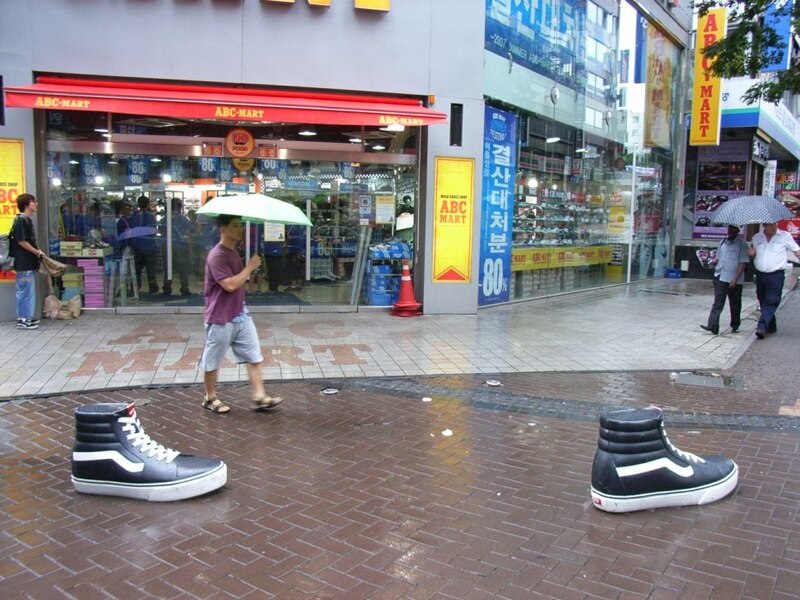 #7abc: Photographs that document Korean sense of humour. Fig. #7a (left): We call them "half-heads" (in Polish: "półgłówki"). Our country overflows with them. 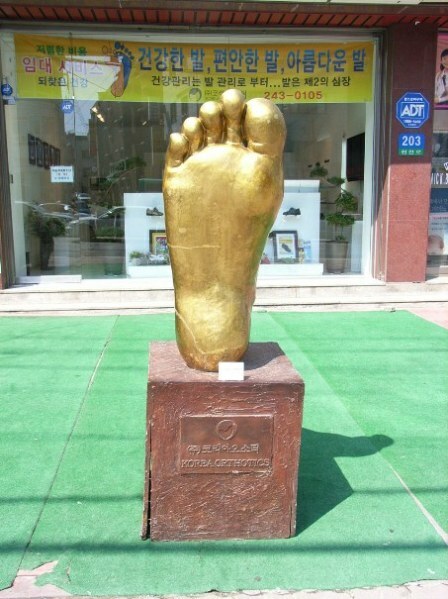 But in Korea they are so rare, that most clearly they are immortalised on monuments (or perhaps sculpturists have no custom to buy more cement when they run out of it before finishing a given sculpture). Fig. #7b (middle): Here is the advertisement which informs that the shop sells shoes. On the above photo an advertisement of normal shoes is shown. But if the shop sells sport shoes, then the "advertisement" looks as follows (click on this "green" writing to see the photo of a Korean advertisement of a shop with sport shoes). Of course, similarly advertise themselves also other shops. Here is an advertisement of the workshop that frames various official (i.e. "rubber-stamped") documents (click on this "green" writing to see a photo of advnertisement of this workshop). Fig. 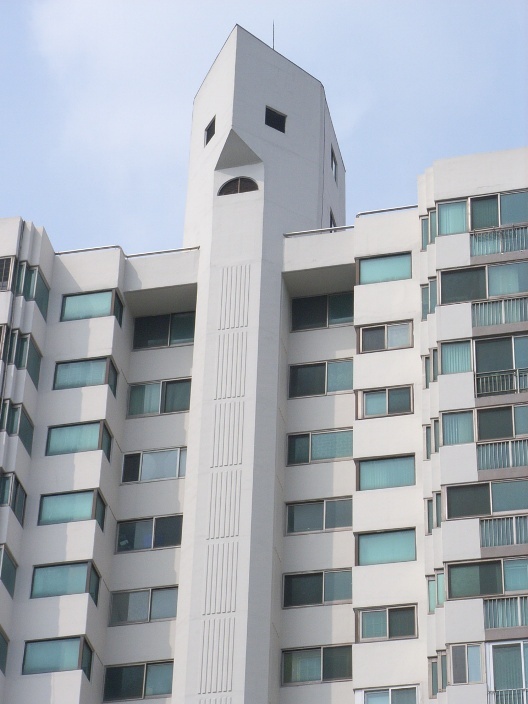 #7c (right): Here is the lift-section of building, designed like a human head. Fig. #8abc: Photographs which show more extraordinary flora of Korea. Fig. #8a (left): Here is the illustration how strange can be flora of Korea. For example, almost everyone knows that in Korea grows a root called "gin-seng", the shape of which resembles approximately a human body. This root has parts the positioning and location resembles the corpse, head, hands, and legs in humans. Surprisingly, this root "gin-seng" displays also healing properties. 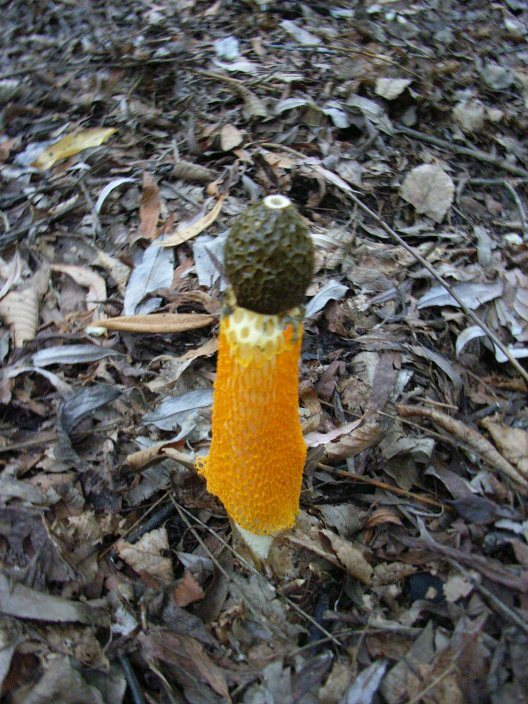 But not many are aware that in Korea grows an extraordinary mushroom, recorded on the above photograph, the size and appearance of which also resembles something human. Interestingly, the above mushroom I photographed in the king's palace "Changgyeonggung" in Seoul. While walking through the park of this palace, I saw a group of scientists who with a great interest studied something on the ground. When I approached them in order to check what it is, I saw the above mushroom. Supposedly it is an extraordinary rarity. The scientists who studied it gave me even its scientific name, but I forgotten it. I know that in Poland there is a relatively similar (inedible) mushroom which I saw it frequently during my own mushrooming in my childhood. In the Polish language it is named "sromotnik bezwstydny" (Phailus impudicus L. ex PERS), and it is characterised by a powerful smell of rotten meat. But the above Korean mushrooms does NOT smell at all. Fig. #8c (right): Here is an example from a huge collection of the unique kind of ornamental vegetation, which are native to the Eastern Asia, including Korea. This vegetation is called "hosta". Shown above is an example of "hosta" which carries the jocose name "Big Daddy". The largest Botanical Garden of Korea, named "Hantaek Botanical Garden" accumulated in my opinion the biggest in the world collection of hosta. An entire album of examples of photographs of only the most interesting samples of hosta from that garden is is shown on a separate web page which I designated entirely to the hosta collection. In Korea there is an extraordinary root called "ginseng". It displays healing properties. Korea is full of shops selling this root. Fig. 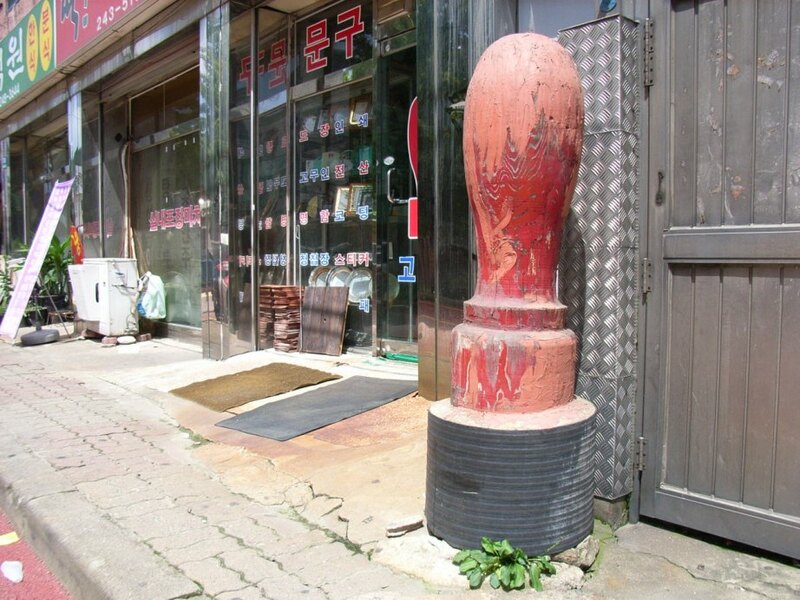 #9: A typical appearance of the shop that sells the "ginseng" root. In such shops the root can be purchased in all possible forms, e.g. raw, dried, in spirit, in flakes, in powder, etc. Please notice that instead of the shop assistance the photograph captured myself in this shop (i.e. Prof. Dr Eng. Jan Pajak). There is a lot of such bazaar shops with the "ginseng" root in Korea. Interestingly fauna of Korea makes a different impression than fauna of e.g. Europe, in spite that it is mainly composed of European kind of species. 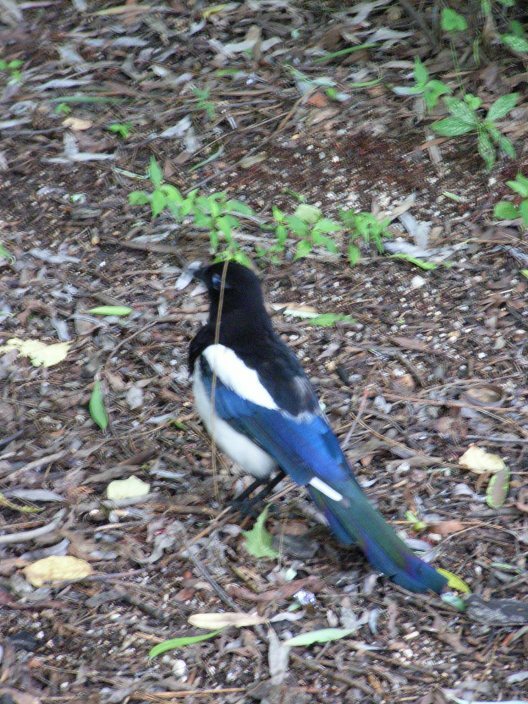 For example, the most popular bird of Korea is - magpie. Magpies are in Korea equally omnipresent as sparrows are in Europe or ducks in New Zealand. In turn the most popular insects are - dragon fly and cicadas. Dragon flies can be seen practically everywhere. There is so many of them in the air, like flies in Australia, sand flies in New Zealand, ants in Malaysia, or ticks in Poland. In turn cicadas in Korea are of the size of European sparrows. In summer days these cicadas make so loud noise, that it "rings" in ears. Fig. #10abc: Fauna of Korea. Fig. 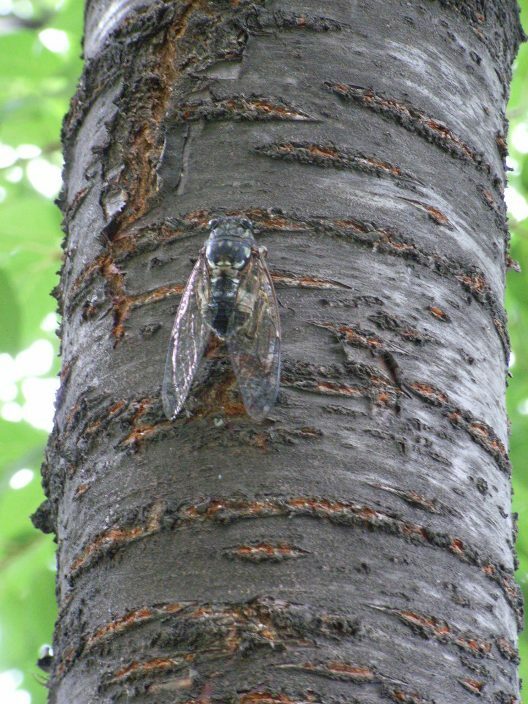 #10b (middle): Here is the most loud insect of Korea, means cicada. In Korea several different species of cicada make their noise - this shown above is the most loud of them all. It creaks so loud, that its screeching echoes in our ears. The noise that it generates for me resembles slightly the sound of creaking produced during a rhythmical rotation of a big screw in dry wood (or a rhythmical rotating a dry cork in tight bottleneck of an empty bottle). This cicada is also very big - approximately the size of an European sparrow. In order to appreciate the size of it one needs to realize that the diameter of the tree trunk on which I photographed it in my estimation exceeded 20 cm. In summer 2007 the South Korea experienced a raid of another, quite unpleasant cicada. This new cicada raided the South Korea from the north, originally arriving from the Southern China, then systematically moving through the Northern Korea towards the south. In August 2007 it already arrived to northern suburbs of Seoul. It is called the "lycorma delictula white". It looks like a spotted moth and has around 5 cm in length. In Korea it has no natural enemies, so it is going to pose a big problem. The article on the subject of it, entitled "Foreign Cicadas Irritate Residents", appeared on page 3 of the English edition of newspaper The Korea Times, issue dated on Saturday/Sunday, August 18-19, 2007. To Suwon this new cicada "lycorma delictula white" arrived already on 25 August 2007, when I heard and saw one of these for the first time in my life. I was just walking through a small park shorthly before the sunset, when I heard the noise of a new cicada, that I never heard before. It sounded to me like a monotonic rattle of machine gun, in which each single shot sounded like a powerful crack of a large electric spark from an electrostatic machine. In fact this rattle was very unpleasant to ears and highly irritating. I started to seek the source of this rattle in order to check whether this is really this new cicada and then I saw it for the first time - exactly as they show it on photographs in newspapers, means large and looking quite creepy. But it already was too dark to photograph it. Fig. #10c (right): Here is the most popular insect of Korea - means a dragon fly. 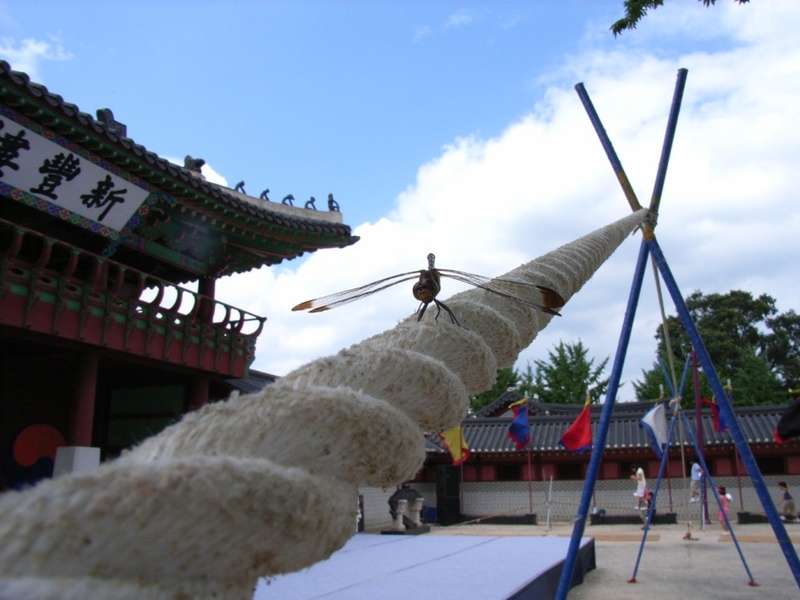 In this case the dragon fly sits on a rope in front of a king's palace. But dragon flies in flight one can see in Korea practically in every place. There is a lot of mysterious phenomena taking place in Korea. There is also a lot of mysterious objects in there. Below I am going to present these amongst them, which I managed to see and photograph. I carry out research of underground UFO caves and tunnels for a long time. These underground tunnels, melted with plasma or carved telekinetically in rocks by UFO vehicles, are utilised by UFOnauts for hiding their UFO vehicles in there, and for establishing underground bases of UFOnauts inside of them. Photographs of some amongst such underground tunnels-caves are presented in several totaliztic web pages, for example in items #22 and #23 of the web page about the Magnocraft, or in item #F1 of the web page about New Zealand. In turn the comprehensive description of these tunnels is provided in subsections G10.1.1 and V5.3 from volumes respectively 3 and 17 of the newest monograph [1/5]. Immediately after I arrived to Korea, my attention was drawn by the next "tunnel" carved telekinetically by a UFO vehicle. It is called the "Jin Cave". It is located on the area of the Seonunsan Provincial Park, from the south-west part of Korea, or more strictly is a part of a large complex of Buddhist temples which are inside of this park. Of course, in spite that this cave is located many hours of drive from the place where I lived, I arranged for an expedition to see it. This expedition confirmed that the Jin Cave is in fact formed technologically by a UFO vehicle. Which evidence confirms this - I am explaining and illustrating below. Unfortunately during this expedition UFOnauts broke my finger as a punishment for "excessive curiosity". Please notice that about this UFO tunnel from Korea, called the "Jin Cave", I am writing also on the web page about the mysteries of the Malbork Castle. Fig. #11: Only rare people were punished with breaking their finger for the fact that they had the courage to photograph something that they do not suppose to photograph. I belong to these rare group. When on 26th of May 2007 I photographed a mysterious "Jin Cave" shown on the above photograph "Fig. #9", some creatures invisible to human sight got so furious, that during taking one of photographs they almost openly pulled my legs when I was just pressing the shutter's trigger. Then they so directed my fall down that I broke my finger. During this extraordinary event I felt on my body the hitting and pushing, like if from someone's invisible hands, while in my mind I heard like telepathically send to me someone's derisive laughter. (I perfectly know this laughter - I already heard it once when UFOnauts, probably just for a fun, poured me and my suit with cold shower - as I described this thoroughly in subsection W6 from volume 18 of my older monograph [1/4], see item "Re. F" in there.) Descriptions of this extraordinary breaking of my finger are provided in item #A4.1 of the newest update of the separate web page about Wszewilki of tomorrow. "Fig. #9" above shows just one of photographs that I managed to take then just before my finger was broken. The photo illustrates the entrance to a cave, which in my estimation was a former entrance to a system of underground tunnels that UFOnauts created under the surface of our planet in order to hide their UFO vehicles from human sight in these tunnels. Amongst local population the above cave is called the Jin Cave. (The name "jins" is another name which in cultures of the East was given in past to UFOnauts. 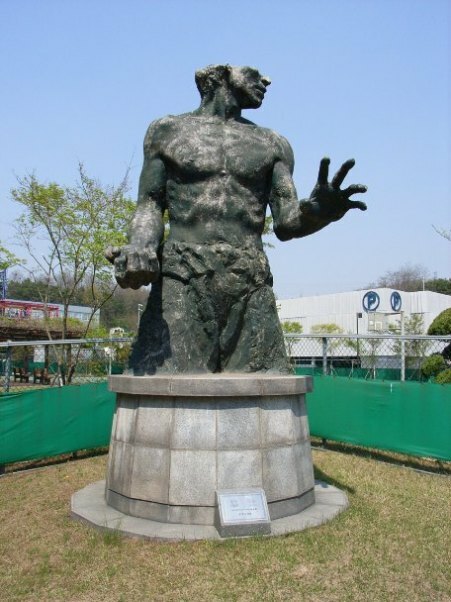 Jins had the same powers as "devils" - only that in past they were considered to NOT be so mischievous as devils are. In our culture jins are mainly known from a fable about the "Lamp of Aladdin" in which one of these powerful creatures supposedly used to live.) The "Jin Cave" shown above is also shown on the web page about mysteries of the castle in Malbork. The diameter of the above tunnel, measured in the horizontal direction, is equal to 4.7 meters, while its height is equal 5.10 meters. This cylindrically shaped tunnel is evenly cut like by a huge drill. It runs from the south-east (the entrance) to the north-west (the interior of the hill). So this tunnel was cut out by a discoidal UFO vehicle type K3 that flied horizontally with the floor directed perpendicular to local force lines of the Earth's magnetic field. The external diameter of a UFO vehicle type K3 is equal to D = 4.39 meters. The carving of this tunnel was carried out through the discharging of powerful telekinetic pressures at native rocks, not through evaporation of rocks by a plasma whirl. So the UFO vehicle which made this tunnel was a UFO of the second, or even the third, generation. The important aspect of this UFO tunnel is, that it was known for many centuries. In turn local people treat it with the highest respect, almost like a holy place. Therefore UFOnauts could NOT secretly collapse it, or remove it - as they did with entrances to many other similar UFO tunnels. But in order to not reveal that it leads to underground UFO bases, some time ago UFOnauts melted in it a vertical partition wall, visible below on photograph from "Fig. #11c", which closes it already around 10 meters from the entrance. What even more interesting, this partition wall that blocks the entrance to remaining parts of this tunnel, was formed by melting the native rock with a hot plasma whirl. In turn the tunnel itself was created by ripping the rock out with telekinetic pressure - this is clearly visible on the photograph from "Fig. #11b" below. 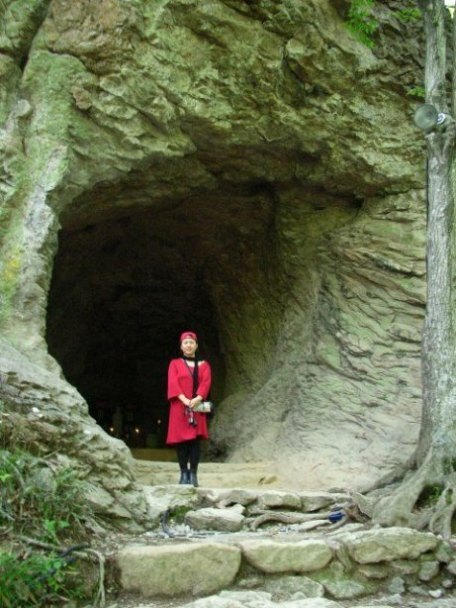 (So Jin Cave is a carved tunnel - not an evaporated or melted tunnel). Such mixing two completely different manners of shaping the structure of this tunnel, both of which are unique and characteristic for capabilities of UFO propulsion system, additionally confirms strongly the technological origins of this tunnel formed by a UFO vehicle. The entrance to a similar UFO tunnel existed also in Poland on the "Babia Góra" Mountain. It remained open in there until around 1920s. (Later UFOnauts hide this entrance.) A similar entrance is also described in the famous German legend about the Pied Piper of Hamelin (the main event of which supposed to take place on 23 July 1284). The description of this legend is even contained in some encyclopedias, e.g. see the prestigious "Encyclopedia Britannica", 1959 - entry "Hameln". According to this legend, in 1284 the township of Hamelin from Lower Saxony (near Hanover), which is positioned at the converge of rivers Waser and Hamel, was infested with a plague of rats. Then this rat-catcher appeared (probably an UFOnaut that had a device for a remote hypnotizing of animals and people). After receiving the offer of a good payment, he led rats out of the city and drown them in the Waser river. But after fulfilling his part of the deal, citizens of Hameln accused him of the trickery and refused to pay the contract. Then, exactly on 23 July 1284, he played again his pipe. In the reply all children of Hamelin left their homes and walked hypnotized following him. After they walked to the local hill called Koppelberg, huge gate opened on the slope. The rat-catcher with the all children - but except for one lame, disappeared inside of this hill, while the gate shut after their passage. (It seems that the lame child was of no use as a slave on the planet of UFOnauts.) The interesting aspect of this legend is that the spoken version of it that I had an opportunity to hear, describes a glossy tunnel leading inside of the Earth, that was hidden behind these gates in the Koppelberg. The hypnotized children marched thorough this tunnel. Its description coincides with the glossy and even tunnels formed on Earth by UFOs, one example of which is shown in "Fig. #9" above. Another example of a similar tunnel existed in Poland on the mountain named "Babia Góra". The entrance of it, according to Polish legends, was hidden behind a gate that looked like an ordinary rock. (This legend about the UFO tunnel from the "Babia Góra" mountain in Poland is described in treatise [4B] and in subsection G2.1 of monograph [5/3], while it is just mentioned in subsection V5.3.2 of my newest monograph [1/5]. At this point I should also explain, that UFOnauts in their activities amongst people obey pedantically the rule to not reveal to humans their continuous presence on the Earth. This major policy of UFOnauts is explained comprehensively on the web page evil.htm - about origins of evil on the Earth. In order to have on the Earth a place where UFOnauts can secretly park their UFO vehicles, they prepared for themselves a whole system of underground tunnels and chambers. Entrances to some amongst these tunnels remain until today in various inaccessible areas of the world. The above UFO tunnel is just one amongst such entrances to UFO tunnels that survived undistorted until today (unfortunately the passage to further parts of this tunnel was purposely blocked with the melted rock). The appearance and principles of technical formation of such UFO tunnels are described on a number of totaliztic web pages, for example on web pages newzealand.htm - about mysteries of New Zealand, or magnocraft.htm - about space vehicles with magnetic propulsion system. Most comprehensively, however, these principles are described in subsections G10.1.1 and V5.3 from volumes respectively 3 and 17 of the newest monograph [1/5]. In turn descriptions of the evidence for the use by UFOnauts such underground tunnels and chambers is provided on web pages about Malbork, and Wrocław. Fig. 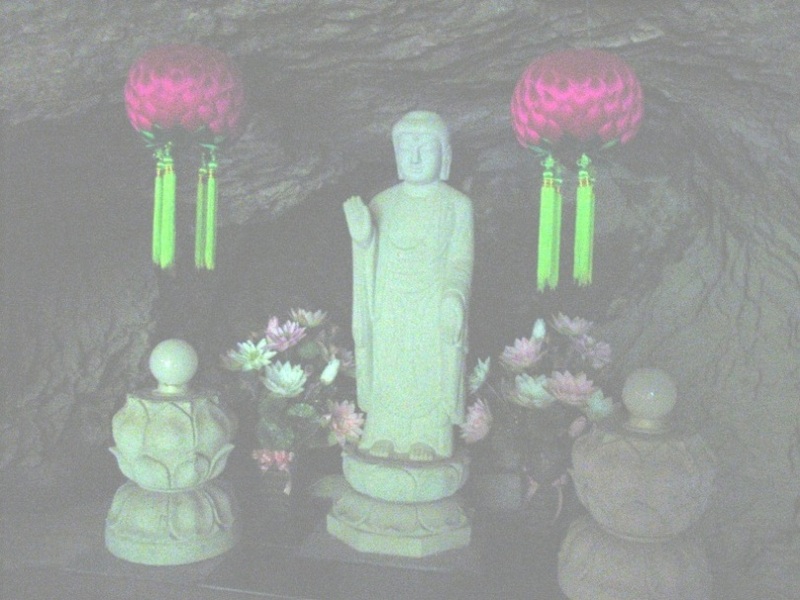 #11bc: Two photographs which document two different manners of formation of the "Jin Cave" shown and described on the previous photograph "Fig. #11". Fig. 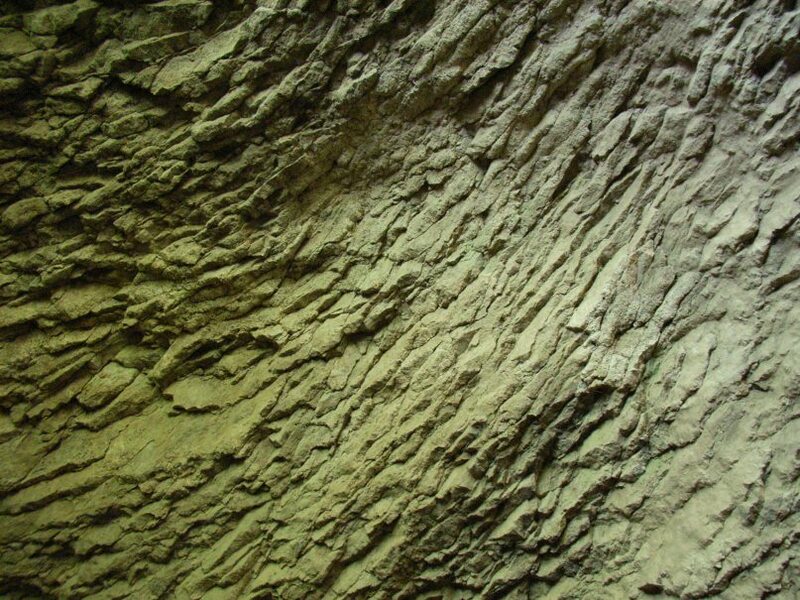 #11b (left): A close-up photograph of the side walls of the "Jin Cave". It reveals that the "Jin Cave" was formed due to precise carving (breaking out) native rocks with the use of telekinetic pressure. Fig. #11c (right): A section of the "partition wall" that blocks the access to the further parts of the "Jin Cave". Otherwise to the carving formation of side walls that is clearly visible on photographs from the left part of "Fig. #11b", this "partition wall" was formed through the melting of the native rock by hot plasma of the UFO vehicle that works in the magnetic whirl mode of operation. In the final part of this cave was quite dark when I photographed this "partition wall". This wall is visible just behind the altar with Buddhist accessories, through which I did not wish to climb in order to photograph this wall, as it could offend my hosts. However, it is still clearly visible that the wall originates due to melting the native rock with the spinning plasma. One can even clearly distinguish the contour in the middle of this wall, in which hovered the discoidal UFO vehicle which melted this wall, before it withdrew from the large droplet of the melted rack that it turned into the liquid form. After the UFO vehicle withdrew itself from the melted droplet of the native rock, the wall closed itself completely leaving however the contour of the UFO vehicle which melted this wall. Although almost everything in Korea looks quite perfect in comparison to other countries in which I had an opportunity to live, still we live in an imperfect world. So in every real matter and in every real country there is always room for improvements. In case of Korea in my opinion the most urgent is the introduction of the Latin alphabet and the replacing with it the local miniature "bushes". Because Korea is located between China and Japan, it has the alphabet which is very similar to alphabets of its neighbours. For myself this alphabet resembles miniature "bushes". Even Koreans acknowledge themselves that their alphabet is supposedly "second most difficult in the world" - right after the Arabic alphabet which is considered to be the "first most difficult in the world". For the visitor from another country this Korean alphabet makes travel extremely difficult. It is because this alphabet that everyone who travels through Korea and does NOT know this alphabet feels a bit like a "blind mouse". I had opportunities to live for some times in two cvountries that in past used Arabic alphabet, but changed it into the Latin alphabet some time ago. These were: Turkey (or more strictly the Northern Cyprus) and Malaysia. Although the level of knowledge of English by so-called "people from streets" in both these countries is similar to the level of English in Southern Korea, one can travel through them without any problems just because they use the Latin alphabet. This Latin alphabet makes that a visitor is able to easily read in them. In addition the history of these countries indicates, that after the change of the alphabet they accomplished a whole array of further benefits - e.g. the increase of readership, the drop in anaphabetism, etc., etc. Therefore, in my opinion, the adoption of the Latin alphabet by Korea is one amongst the most urgent, important, and the most beneficial strategic moves awaiting to be implemented in that country. Korea is immensely fascinating country with hugely successful nation. Perhaps we should start to watch it closer and draw role models from various more constructive accomplishments of its people. At this point I must admit, that I seem to receive a lot of emails the authors of which send me time and labour consuming requests, while simultaneously displaying a complete ignorance in matters that I am researching. Copyrights © 2017 by Dr Jan Pająk. All rights reserved. This web page is a report from outcomes of research of the author - only that is written in a popular language (so that it can be understood by readers with non-scientific orientation). Majority of ideas and presentations providedd on this web page (and also in other publications by the author) are unique for the author’s research, and thus from the same angle these ideas were NOT presented by any other researcher. As such, this web page presents a number of ideas, inventions, theories, illustrations, tables, etc., which are the intellectual property of the author. Therefore, the content of this web page is the subject to the same laws of intellectual ownership as every other scientific publication. Especially the author reserves for himself the moral credit and copyrights for the scientific theories, discoveries and inventions, photographs, illustrations, tables, etc., mentioned or utilised on this web page. Therefore, the author reserves that during repeating any idea presented on this web page (i.e. any theory, principle, explanation, deduction, interpretation, device, evidence, proof, discovery, invention, photograph, illustration, table, etc. ), the repeating person revealed and confirmed who is the original author of this idea (means, as it is used in creative circles, the repeating person provided a full moral "credit" and recognition to the author of this web page), through a clear explanation that a given idea is repeated from the web page authorised by Dr Jan Pajak, through indication of the internet address of this web page under which this idea was originally explained, and through mentioning the date of most recent update of this web page (i.e. the date indicated below).